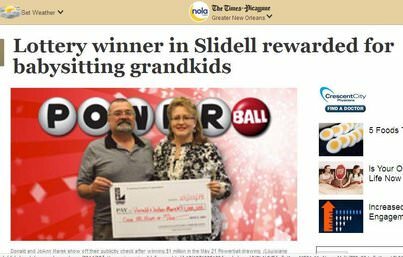 A Powerball ticket sold at the Racetrac convenience store #380 on Gause Boulevard for the May 21 drawing matched 5 numbers drawn but not the powerball. Donald Marek’s quick pick purchase won for him a cool million dollars. The interesting thing is that Marek is from Wisconsin and had only traveled to Louisiana with his wife JoAnn to babysit their grandchildren. Meanwhile, Marek may just have set the record for the largest remuneration ever for babysitting.